Have a Harry Potter fan you need to buy for? 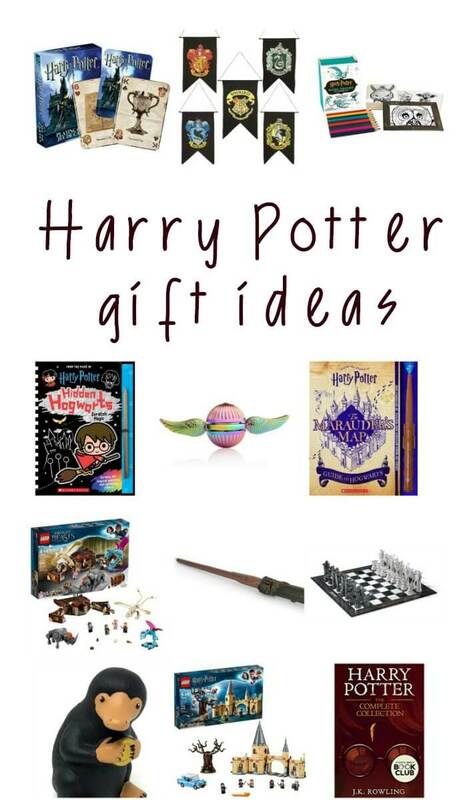 Check out these great Harry Potter gift ideas – ranging from under 10 bucks and up! Confession time – I am a HUGE Harry Potter fan. A HP nerd, if you will. I read the entire Harry Potter series when I was in high school many years ago. I have seen all the movies and read the newer books. I have taken the taken the sorting house test and am proud to say I am a Gryffindor. I love butterbeer lattes. Yup. I’m a potterhead. I love all things HP. Do you have someone who loves Harry Potter too? Check out these great Harry Potter gift ideas! Unofficially Harry Potter Joke Book – My kids would LOVE this HP joke book! They love telling jokes to each other and just laughingggg. Harry Potter Triwizard Maze Game – Race through the Triwizard maze to get to the finish line, but beware of magical spell cards which could send you back to start. For ages 5 and up. Harry Potter Playing Cards – Regular play cards with a Harry Potter theme, these make a great stocking stuffer. Funko Harry Potter Mystery Mini – Harry Potter characters have been given the Funko Mystery Mini treatment. Great for collectors. Harry Potter Ravenclaw Wall Banner – Have a Ravenclaw on your list? They will love this officially licensed Harry Potter Wall Banner featuring the Ravenclaw emblem. Harry Potter Magical Creatures Coloring Kit – Bring the magical creatures of Harry Potter’s world to colorful life with this collectible kit includes 30 coloring cards and colored pencils. Harry Potter Fidget Spinner – A fidget spinner that looks like the “Golden Snitch” from Harry Potter with a great color mixture and patterns while spinning. Hogwarts Scratch Magic Book – My kids love these scratch books. What’s better than a HP scratch book?? Talking Sorting Hat and Sticker Book – Get sorted into House Gryffindor, Ravenclaw, Hufflepuff, or, yes, Slytherin, with this delightfully magic talking sorting hat, just like in the Harry Potter films. Maurader’s Map to Hogwarts – Find out all the secret passageways in Hogwarts thanks to this fun book. Fantastic Beasts Niffler Plush – Harry Potter fans can cuddle with an authentic recreation as seen in Fantastic Beasts and Where to Find Them. Harry Potter and the Fantastic Beasts Minifigs – Harry Potter LEGO fans will love this collection of minifigures. Harry Potter Silver Plated Earrings – This earring set comes with snitch, HP logo and the deathly hallows. Harry Potter Official Scarf – Choose a soft scarf from your favorite house: Gryffindor, Ravenclaw, Slytherin, or Hufflepuff. Harry Potter Wand Kit – A fun set of wands to choose from to make into necklaces or key chains. Funko Pop Harry Potter – Harry Potter and Hedwig are great for collectors. Harry Potter Chess Set – Play chess, Harry Potter style, with this fun chess set. Harry Potter’s Broomstick – Pretend to play quidditch and other Harry Potter games with a broomstick just like Harry’s. Harry Potter Illuminating Wand – Wave the wand and the light goes on and wave it again, and it turns off! Lego Fantastic Beasts Newt’s Case Magical Creatures – Build a foldable LEGO Fantastic Beasts replica of Newt’s Case of Magical Creatures, with a ladder, nest, shelter and Occamy egg. The complete Harry Potter series – Get all 7 books in the series! You will not regret this purchase either as a gift or for yourself. Harry Potter Coding Kit – Build a wand that responds to your movements. Comes with wand parts, PCB with codeable LED, button, batteries, step-by-step book, stickers, poster, and free Kano app. LEGO Harry Potter Hogwarts Express Kit – Build a LEGO Hogwarts Express train set, with removable side panel and roof, plus railway bridge and Platform 9¾, then begin your own magical journey. Niffler Bank – Help your Harry Potter fan save their galleons! Nifflers are attracted to shiny things, which makes them the perfect treasure finders (and keepers). LEGO Harry Potter and The Chamber of Secrets Hogwarts Whomping Willow – Harry Potter LEGO lovers with love building the incredible magical castle set. The brick-built Whomping Willow features spinning branches, a three-story castle model with a gate, and other accessories like potions wands and other magic LEGO items. Harry Potter’s Remote Control Wand – Harry Potter fans can use this wand to turn on and off TVs, Blu-ray players, and speakers.